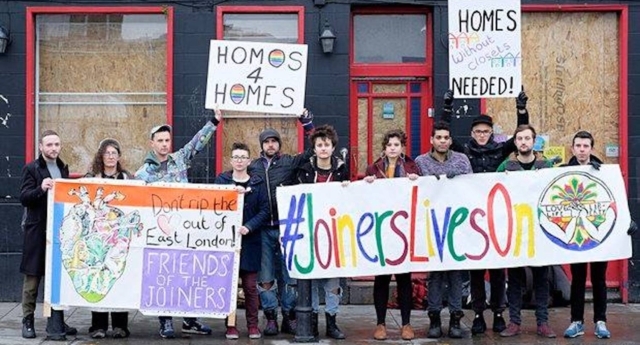 A protest is to take place two years after the closure of the popular London gay pub the Joiners Arms. A demonstration will be held outside the Joiners Arms, Hackney Road, on Saturday 21 January. The protest starts at 1.30pm and is being held to mark the two year anniversary of the closure. The demonstration is organised by the Friends of the Joiners Arms, a community group founded in 2014 to save and evolve the Joiners Arms pub. The group aspires to bring the pub into community ownership, so it becomes London’s first cooperatively owned, LGBT+ community centre, with the pub a central part of its operation. The Joiners Arms in Hackney went through a lot, as the local council rejected calls from the Metropolitan Police to revoke its late licence. The Met claimed crime in the area could be reduced if the bar was closed earlier. As of 15 January 2015, the bar closed, as its management were told that the lease on its premises will not be renewed. As part of a large development, the pub was to be converted into accommodation, much to the dismay of manager David Pollard and the bar’s regulars. But no further planning applications have been submitted and the bar has remained closed. A statement on the bar’s website read at the time of closure: “The Joiners Arms has won renown as a friendly, safe and welcoming venue. We were – and remain – the very first pub to sign up to the Living Wage as a minimum for all its staff. More than 3,100 people signed a petition last year against plans by police for the venue to close at 12.30am each night.